The riders will be given multiple attempts on one single chosen feature for that week and then ranked by best trick completed. After four weeks each area will be covered and the riders overall ranking will be decided by their top three scores. Each rider will get two turns. The rider’s run will begin when he or she leaves the dock and will continue until he or she falls, or the carrier reaches tower one a second time. This means the rider gets a full lap and an extra pass on the first stretch. (This may vary from site to site due to size of the cable, at TSR the run ends after the rails in stretch one, at BSR the end is after the kickers) The rider must let go before tower one. We will go through the running order and then return to the first rider and go through the complete order a second time. The judges will choose the riders best run and discard the other completely. 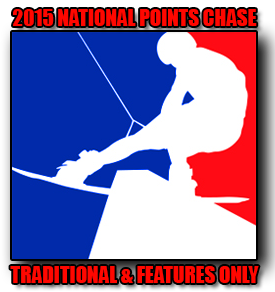 All divisions EXCEPT beginner & amateur wakeskate will get a wildcard. The wildcard is one extra trick that will be added to the riders best run. The wildcard trick should be done immediately following the riders second turn if he or she does not fall. Just remain riding and perform your wildcard where appropriate. If the rider falls on their second run they should immediately return to the starting dock to get their wildcard turn. While on your wildcard lap ONLY do the single wildcard trick or the judges may score the wrong trick. The same trick will not be scored twice in the same run but can be repeated in the second run since the judges will be taking the best turn not a combination of the two.